Learn how to get started on creating a system that will bring in steady, qualified referrals. 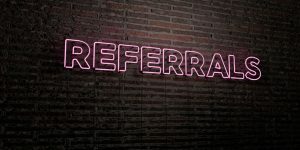 Save time and money by developing a referral system! What better way to grow your business than by having happy customers be so satisfied with your product or service that they advertise for you by sending referrals! You can spend countless amounts of time and money on marketing but truly, nothing is more effective than a referral. We all would love to never have to make another cold call or never have to advertise our services again because we have a steady flow of quality referrals. The good thing is that this is possible! However, getting there takes time, commitment and often change. There are several active strategies you can take to be well on your way but, you must make them habit! Most things we do, we do out of habit. Maybe things have always been done that way and it’s what you were taught or maybe you just got stuck in a rut. To purposely form a new habit, it takes dedication, effort and time. But, before long, what once was something you felt you had to push yourself to do is just getting done naturally and with ease. Why do I mention habit when it comes to gaining more referrals? Because in order to start seeing a true influx of quality referrals who are ready, willing and able to buy from you, you must habitually implement action. Good strategies, of which I will lay out a few below. First, notice three very important words I mentioned above. Ready, willing and able. To be classified as a good, quality referral, the prospect must be all three of these. They need to be ready to make a move and to see change that your product or service can provide them. They must be willing to take action and spend money on your product or service. And finally, they absolutely must be able to buy! They can be ready and willing but without the funds to proceed they are stuck. These prospects are great to keep working with so when they are able…they will buy from you. Anytime a new referral or prospect comes through, be sure to categorized them based on these three principles. Secondly, include ways to reach out to your current clients and your prospects on a regular basis that is not invasive. A good way to do this is to include personal touches in your communications. For example, sending a thank you card after a conversation with a prospect or client. Take note of special events in their lives and reach out to them with a card or note congratulating them. You can also send them small items of value as a token of appreciation and information that they will actually find beneficial to them. These might seem like small things to do but when most other businesses don’t do them, it makes you stand out and can have quite a positive impact. Finally, make sure that with whatever system you put into place, you are being consistent. Generating a good, quality flow of leads through referrals takes time and persistence. If you habitually execute a planned program, then you will more quickly reap the benefits.